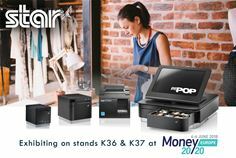 High Wycombe, UK, 29 May 2018 – At Money 20/20 Europe (4 – 6 June 2018, The Rai, Amsterdam) Star Micronics, a global manufacturer of point-of-sale hardware and a market leader in printing solutions for mobile POS and payment applications within the retail, hospitality, delivery, transportation and banking sectors, will be demonstrating its extensive portfolio on Stands K36 and K37. Renowned throughout the industry for its product innovation, Star offers the largest range of MFi supported Bluetooth countertop and mobile printers along with WiFi, Web and Cloud enabled POS printing solutions providing seamless connectivity for tablets, smartphones and handheld devices. Star’s expertise in specialist hardware integration in complex, multi-platform environments has resulted in its solutions being selected by a number of customers within the retail, hospitality and banking sectors in particular. BBVA offers the Star mPOP™ combined Bluetooth printer and cash drawer as well as the countertop printer TSP143IIIW in its Smart Business solution for retail and hospitality while Crédit Agricole provides the Star SM-L200 and SM-S230i mobile printers in its Smart TPE mobile payment solution. Star is also working in partnership with software provider Wynd to offer Le Crédit Lyonnais customers tablet POS solutions that incorporate the Star mPOP and TSP143III, available via Econocomshop France. Continually pioneering solutions that seamlessly combine sophistication with high functionality, Star’s new mC-Print 2™ and mC-Print 3™ aesthetically match the sleek, modern design of tomorrow’s retail environment and provide feature-rich, front-feed compact printers that offer exceptional functionality. With a print speed up to 250mm/second, the printers can feature all of the following interfaces in one model: Ethernet LAN; Bluetooth (MFi); traditional USB; lightning USB (data and charge USB for iOS) and CloudPRNT™ as well as Hub functionality for more than one peripheral; scanner, customer display, etc. Expanding Star’s unique and innovative portfolio, the latest addition to its renowned TSP100 futurePRNT™ series is the unique TSP143IIIU – the only USB receipt printer today to communicate and charge simultaneously and directly via the Apple supplied lightning cable with an iPad, iPod or iPhone for reliable USB communication. This printer removes the insecurity of wireless connection and seamlessly combines the flexibility and cost savings of tablet POS with the reliability of traditional POS. Star’s success with the undoubtedly large number of ISVs has been achieved via its attention to detail regarding SDKs and documentation enabling easy integration. Its experience is that many software solutions already work with the TSP143IIIU whilst others can easily integrate with the new SDK, knowing that it covers all products in the renowned TSP100 range. The TSP100 Series will remain the tablet POS printer series of choice due to its vast connectivity models including Bluetooth and WLAN. Selected by a number of customers within the retail and banking sectors, the cost-effective all-in-one tablet POS solution, mPOP is a unique combined Bluetooth printer and cash drawer mobile point of purchase station mPOP that is low cost and lightweight at just 10cm high and 30cm wide with a sleek design.